To prepare for consultations and training sessions with clients, I often ask to see annual reports and other formal documents provided to funders, donors, and the government as an overview of the organizations’ performance. And I am almost always disappointed at the way in which volunteer involvement is barely mentioned. Just last week I read a “State of the [Organization Which Shall Remain Anonymous] Report 2012” for a very well-known charity that frequently claims to engage “millions” of volunteers. The report was 62 pages in length and the word “volunteer” was mentioned a mere 16 times – almost always in a phrase pairing it with employees, as in “our staff and volunteers,” or in the context of board member volunteers. Not a single sentence was devoted solely to any activity or service provided mainly by frontline volunteers. Further, the word was totally absent from any financial data (including no mention for expenses incurred to support the work of volunteers). The invisibility of volunteers in many agency reports is matched only by the presentation of generally useless information about volunteers in other reports. It’s as though executives, public relations experts, and accountants suffer from collective brain-freeze when describing their organization’s work. What else can explain the missed opportunity of shouting proudly to the world about a major group of supporters, vital both to client services and to the bottom line? It’s up to the leader of volunteers to educate up on this subject. Maybe you can make it an exciting end-of-year, happy holiday message – which is why I am focusing on this in the December Hot Topic. Without “blaming the victim,” the problem of invisibility often starts with inadequate monthly reports from the volunteer office. Just because no one has asked you for more data does not let you off the hook from providing insightful information top management needs to understand the volunteer workforce. I contend that providing regular, useful reports that spotlight volunteers is one of the most important roles of the volunteer resources manager. Even if it takes time and even if you don’t much like writing them (but you can always recruit a “volunteer assessment team” who actually enjoy the process of collecting, analyzing, and reporting data). If you report throughout the year on key statistics, it becomes comparatively simple to cull out the most vital data for an annual or year-end report. You can provide consistent overview information each time, but every month you can also highlight a different aspect of volunteer involvement in more depth. The point is to dig down a bit, revealing more about what statistics mean in daily practice. Not only will this open everyone’s eyes about the amazing work force operating under the radar, but it will also underline why the volunteer office more than earns its budget (and maybe should get more resources). Remember that no one but you sees the entire picture of volunteer involvement and knows all the volunteers. Why keep the secret of who they are and what they do? Below I suggest several levels of data analysis that could be reported to change everyone’s perception and understanding of volunteer contributions. Demographics: Ages, gender, race and other ethnic diversity – possibly comparing the volunteer data to the same information for your paid staff or, more critically, for the clients or public you serve. Also, is there geographic representation of all the locations you serve? What foreign languages do volunteers speak? Is this diversity something that should be spotlighted as showing the range of your organization’s supporters? Has this data remained the same for a long time? Are you recruiting different types of volunteers recently? Intentionally or surprisingly? Education and professional expertise: What is the education level of volunteers (particularly how many have advanced degrees)? What occupations are they currently in or have they retired from? Does this make the volunteer workforce an extension of the paid staff or a special skills group that expands the knowledge base and abilities available to the organization? Many volunteers are professionals, even if in an occupation different from the employees of your organization. Again, is this changing over time? Intentionally? Affiliations: Many volunteers will come to you individually, but others come through various corporations, faith communities, civic and service clubs, schools and other community organizations. Find ways to report this very important collaboration component of volunteer services. Their relationship to your mission: Are they personally affected by the cause, disease, or focus of your work (often in a way not necessarily true of employees)? Were they, or members of their family, clients of your services? Successful graduates/alumni? Can you capture these personal stories in a way that shows why volunteers are dedicated and also how important the work of the organization is to many? Their role as or interrelationship with financial donors: How many volunteers are money donors as well as time donors? How many money donors are also volunteers? This of course assumes you have access to the donor data, which is rare for the leader of volunteers. You need to make the case for why it is vital to compare the lists at least annually. And point out that it’s important to look at family names or shared addresses, as one member of a family might write a check and therefore be recorded as a “donor,” while other members of the family might give lots of volunteer time, which goes unnoticed by the development office. Note that I have not included hours served or longevity/retention. No problem if you report those, but they are pretty meaningless without lots of information about what those volunteers are doing while they spend their time in service. Basic service categories: Make sure that you regularly describe all volunteer positions that are ongoing, and don’t assume “everyone knows.” They do not. Be specific, listing all roles and projects underway in each unit. Highlight those that are part of primary service delivery to clients. Point out what volunteers do that no one else would do otherwise (value-added). Explain how the work of volunteers frees paid staff to do the things that most deserve employee attention and training. Note which volunteer assignments are adapting in what ways to new client or staff needs. Special, episodic, on-call services: The volunteer office responds to all sorts of unexpected requests, from carving the Halloween pumpkins to guiding that group of Vietnamese visitors around the facility. Record those services and report them, as well as seasonal activities (Christmas caroling), one-time group work (garden clean up), and even those five volunteers rotating being on-call each weekend, whether or not they need to come in. While you might recruit new volunteers for special activities, often you will tap volunteers in ongoing service to handle an unusual request. Be sure you record such contributions in their individual files, but periodically note how many volunteers do such extras. Where/how volunteers work: It’s a misconception that most volunteers work on-site, on a regular shift of duty. Clarify what volunteer work is done off-site, in the field, in client homes, virtually via computer and Internet, or anywhere a volunteer chooses. This may even expand your volunteer demographics, as online volunteers could reside anywhere in the world. Design a greeting card to look like a scroll and head it 24 Surprising Facts about What Volunteers Have Given Us this Year; then list any of the information just described above. Distribute it as widely as possible. Rework the words of Christmas carols, Chanukah and Kwanzaa songs to praise volunteers. Example: On the first day of Christmas, volunteers gave to us…their priceless talents and skills. On the second day of Christmas, volunteers gave to us…two successful auctions and…. Get a group of employees to sing the songs at all parties during the month. Add a line under your signature in all your e-mails (and update it weekly) sharing factoids such as: Did you know that our organization’s volunteers speak 14 different languages? OK. It’s your turn. 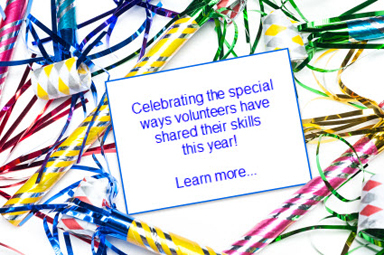 How can you find factual-and-fun ways to celebrate volunteers at this holiday season? This is good information. I just keep up with just the day-to-day volunteer coordinator work that includes loads of emails. I am a part-time VC and really cannot add some of these great ideas into my 18.5 hour week. But it's still good info to know in the event someday I do have some extra time. Ask your volunteers to tell you why they volunteer for your organisation. We recorded on audio and video vounteers talking about why they love volunteering for us and have used these audios/videos in our online advent calendar. So touching and very powerful. Have a client letter or note written about 'what a volunteer did to touch me'. It is powerful. And, if you have volunteers who do more than one position, highlight their multiple duties. If your organization is large or spread over a community, you will find that many within your own organization are not even aware of the multi-support provided by just one or two volunteers. Point out when your volunteers do their magic. Our first volunteer arrives at 5:30AM and the last one leaves at 1:30AM. Know your applicants as well as your volunteers. For example, when do your applicants make application? Our applicants apply online and we receive the majority of applications between 8 and 11PM. The work day is over and adults have the kids to bed, while college students are wrapping up their studies for the evening. Note that we wouldn't get the same number if you had to come to the office and apply. Are your office hours to benefit you or your volunteers? Or at least are your services available when you are not? #1: INCLUDE volunteers in writing your portion of the organizations End of Year Report. Many of our long standing volunteers keep journals and we include some of their journal entries in the report. Personal field stories are priceless and uplifting. #2 News clippings, blogs posts and press releases that ran during the year acknowledging volunteer efforts are reprinted (with permission)in the Report. #3 A GROUP photo is always included in our Report; of the entire volunteer network (panoramic cameras do the trick). Put a well deserved "face" to your volunteer team,(knowing that important people will be reading it) is the best end of the year thank you, you can give any volunteer! #4 Highlight one or two stand out volunteers and why in the Report. This brings a sense of accomplishment and pride to those selected and raises the bar for the rest of your volunteer network.